The options listed within the Access and Distribution section control which teams can view the results of the report within the site and which teams or individuals receive the scheduled distributions. Use the checkboxes to select team(s) to receive the report via email - the list of recipients being dynamic based on team membership - and/or enter specific addresses for those individuals or email aliases which should also receive the distributions. 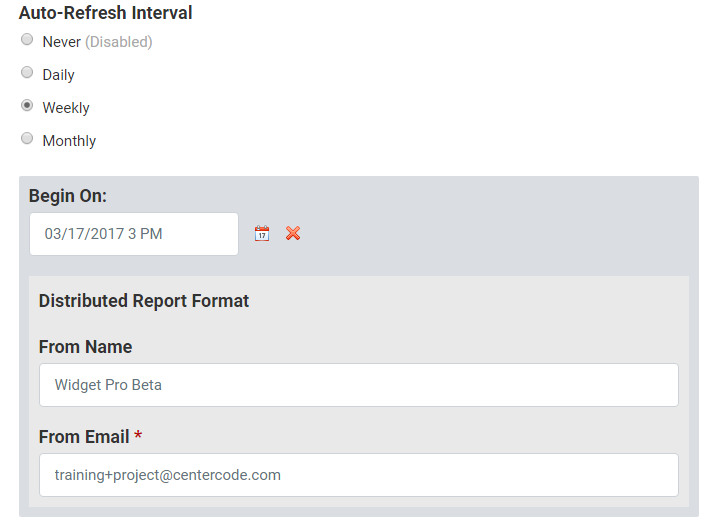 After adding recipients for your report distribution, you'll select an interval for how often you want the data automatically refreshed and sent to the recipients including a starting date and time. Distributions will be sent from the From Name and Email address entered below.